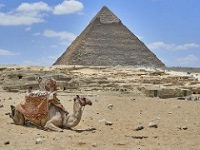 Egypt is the world's premier tourist destination for historical sightseeing. From the mysterious and awe-inspiring Pyramids of Giza, to the Nile's West Bank, to the 3,000-year-old temples of Abu Simbel and the beguilingly beautiful Coptic Cairo, those with an interest in ancient civilisation will find themselves in heaven on holiday in Egypt. However, tourists who take a less cultural approach to holiday-making will not be disappointed by the Land of the Pharaohs. Activities in Egypt include diving and snorkelling on the coral reefs, river cruises on the Nile, and camel treks into the Sahara. In places such as the magnificent Sinai Peninsula, tourists can combine these adventures with experiences of real cultural significance. Egypt has a world-class array of holiday resorts. From the bohemian charm of Dahab, to the glitzy elegance of El Gouna (known as the 'Venice of the Red Sea') and the creature comforts offered by Sharm el-Sheikh, those looking for a top-quality holiday resort in Egypt will find themselves spoilt for choice. With an astounding variety of things to see and do, great weather, a healthy and delicious national diet, and wonderful souk (open-air market) shopping opportunities, it is plain to see why Egypt is one of the world's favourite holiday destinations. Egypt experiences hot and dry weather all year round, although things are marginally cooler and wetter in areas adjacent to the coastline. The sun can be uncomfortably fierce during summer (May to October), so tourists to Egypt are advised to travel between November and April. Visitors are also strongly advised to assess the political situation in Egypt before they finalise travel plans, as the region has sometimes been volatile in recent years. Read more on Egypt's Climate and Weather. -Be awe-struck by the Great Pyramid of Giza, the last remaining ancient wonder of the world. -Don't miss the 3,000-year-old temples of Abu Simbel: mind-blowing structures carved into the surrounding sandstone cliffs. -Do a little souvenir shopping at the Asfour Crystal Factory. -Explore the wonders of the beautifully located Saladin Citadel built in the 12th century. Read more about Egypt Attractions. -Take a cruise down the Nile, and savour the incredible sights, including the Temple of Karnak and the Valley of the Kings. -Get lost in the narrow streets of Coptic Cairo, the oldest part of the city, once known as the Roman stronghold of Babylon. -Go scuba diving in the Red Sea to explore the coral reefs and shipwrecks. -Send your senses into overdrive shopping at Khan al-Khalili, one of the largest, most vibrant markets in the world. Read more about Egypt Activities. Egypt has many popular resorts for sun-seekers looking for the perfect beach holiday. Each resort has its own character, some offering lively nightlife and others secluded tranquillity, some designed for sun-seeking singles and others for family fun. Find your perfect Egypt holiday resort here. There are direct cheap flights to Egypt available from the UK. The flight duration from London to Egypt is approximately four to five hours. There are also direct cheap flights to Egypt available from the US. The flight duration from New York to Egypt is about 12 hours. Get more information on Egypt Airports. The Alexandria Quartet by Lawrence Durrell, Death on the Nile by Agatha Christie, The Yacoubian Building by Alaa-Al-Aswany, and Beer in the Snooker Club by Waguih Ghali. Mohamed Mounir, Amr Diab, Abdel Halim Hafez, and Umm Kulthum. The Yacoubian Building (2006), Anthony and Cleopatra (1963), The Mummy (1999), and Raiders of the Lost Ark (1981). Karkaday is a ruby-red, hibiscus flower-infused non-alcoholic drink, served in tea shops right across Egypt. Wonderfully refreshing and cooling, it is also (apparently) a good hangover tonic. Taamiya is a falafel made from green beans and spices, usually served in a pita with baba ghanoush (puréed aubergine spread). Shwarmas are pita bread typically filled with marinated lamb and hummus (puréed chickpeas). Be on the look-out for perfumes, brass and silver ornaments, blown-glass and clay figurines and, pick of the lot, rich Egyptian cotton products with Bedouin embroidery. Lightweight (but not overly-revealing) clothing, plenty of sunscreen, good walking shoes as well as sandals, and a swimming costume or two. Cairo is also a notoriously noisy city, and many travellers recommend taking a pair of ear-plugs. Held each year in February and October, the Abu Simbel Festival celebrates Ramses II's birthday. In October each year, the Cairo Opera House produces an outdoor performance of Verdi's Aida, a tragic tale of thwarted love set in Ancient Egypt, which is performed at the Great Pyramid of Giza. The Cairo International Film Festival (November) is one of the longest-running film festivals on the African continent. More information on Events in Egypt. -Beer was invented in Ancient Egypt. -Africa's only subway is found in Cairo. -Egypt is home to about 30 percent of the Arab world's bloggers. -Egyptians invented the 365 day calendar. A favourite tourist destination, visitors to Egypt can look forward to unique sights, exciting activities and plenty of hours of relaxing on one of the sunniest coastlines in the world.